Another recipe from the kitchen of our friend Margi Newkirk. Margi said she got this from some friends of theirs who were originally from Ireland. 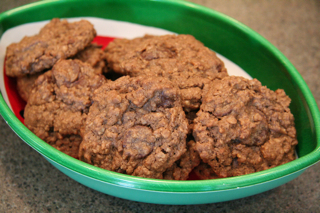 These cookies had an interesting twist in that they definitely pack a chocolate punch, but the hint of the coffee flavor finds it’s way through. At the time I couldn’t put my finger on the flavor, but seeing the recipe, it makes sense. The bottom of the pictured watermelon bowl was visible within no time. My kids were upset with their father. My stomach was in heaven! Cream together butter, shortening, and sugar until very fluffy; add coffee mixture and vanilla. Stir dry ingredients together and beat into creamed mixture. Stir in chocolate chips. Drop by spoonfuls onto baking sheet. Bake at 350 for 7-8 minutes. Don’t overbake! !